Here in the United Kingdom, the BBC and the British Museum have collaborated on a project that aims to highlight the history of the world through 100 objects from the British Museum’s collections. A History of the World in 100 Objects was started three and a half years ago and the project strives to reshape the British Museum as a location to explore world history and appeal to non-traditional audiences. The project has included 100 radio lectures by the British Museum’s Neil MacGregor about each object, a website, and television programs. In addition, the BBC and the British Museum have created lesson plans that focus on a selection of objects chosen for the project and produced a 13-part series for BBC’s children’s division. While this project is interesting in and of itself, it has become much richer through the participation of individuals and museums across the United Kingdom. The British Museum took over two years to choose the 100 objects from their collection and the project was expanded through partnerships and networks of both the BBC and the British Museum. Regional television and radio stations teamed up with their local museums to compile their own top ten objects lists and local communities were invited to upload their own personal choices to an interactive website that took two years to develop. On the website, you can see (and listen to radio programs about) the 100 objects from the British Museum and also view others that have been contributed. Over 350 Museums in the United Kingdom have contributed objects plus scores of individuals have uploaded objects from their personal collections. The website also allows viewers to look at the objects through time in a number of different ways. By pulling up the Explore section you can look through objects that have been filtered by material, color, location, etc. and see these objects sorted by the timeframe in which they were created. By moving the time scale to your right, you see only the objects that you have chosen to see through your particular sort. The radio and television programs have highlighted the deep stories that objects can tell and encourage listeners/viewers to look deeper at objects to uncover their mysteries. One object, a broken rocking horse from the Sunderland Museum and Winter Gardens, dates from a children’s music hall performance in 1883 when a stampede for free toys led to 183 children being crushed to death against the doors. As a direct result of this disaster, emergency exits in every building were designed to open outwards. This object stands as a record of this event and subsequent changes in building code, although you wouldn’t know the story just by looking at the broken rocking horse if it weren’t highlighted through this type of program. One goes through such emergency doors many times in a day without any knowledge about the specific event that caused the building codes to change. A project like A History of the World in 100 Objects allows modern technology, visitor-added content, and web connectivity to explore history and objects in relevant ways and provides us with information that adds stories and depth to our everyday encounters. The collaboration has had a great result in the United Kingdom with many participating museums reporting record crowds, particularly during the February school break shortly after radio and television programs began to air. 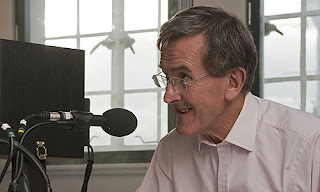 But there has also been criticism that stamina is needed to keep up with a daily radio program, that web access is required for full participation, and the use of only Neil MacGregor’s voice emphasizes the British Museum’s control over the project. In addition, having all 100 objects come from the British Museum disturbs some audiences as objects were frequently acquired during the era of Britain’s colonial expansion and countries of origin may have issues with the British Museum acting as authority over these objects (article). 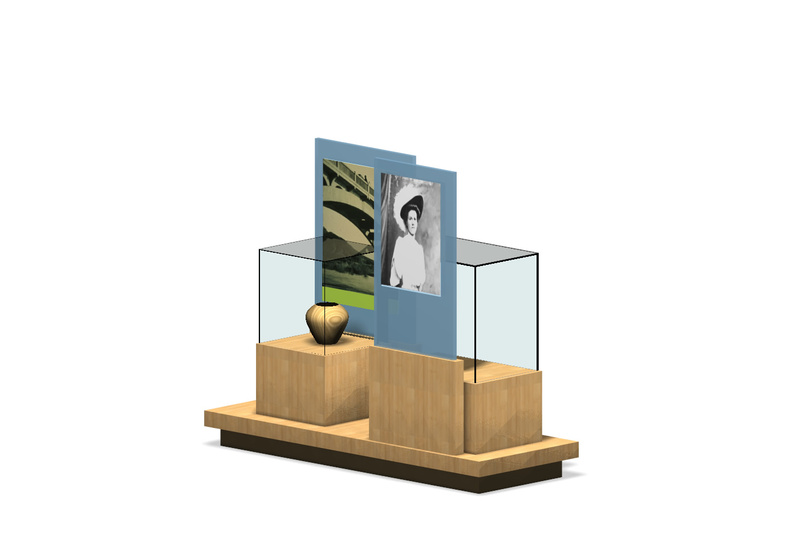 Never the less, the project extends beyond the 100 objects to include items submitted by other Museums and individuals. As such, this is a program that could be replicated in the United States or other countries (despite the fact that the British Museum claims otherwise) or could be re-created on a smaller scale, such as the history of a particular country or region through specific objects that Museums and individuals can add to. Even without the resources to create a new program, individuals can contribute objects to the 100 objects website and add objects from their personal or Museum collections. While it appears that only Museums in the UK can participate as partner institutions, any individual can contribute an object, as I learned from personal experience. I decided to participate and add an object that I thought represented something in terms of world history. This turned out to be harder than I thought. Going through my things I found many objects that were important to me or to my family but it was hard to identify something that had meaning to the larger world and had historical meaning. After looking again at my belongings and at the website I chose my Magic 8 Ball because it was ubiquitous in the bedrooms of my friends in our 70’s childhoods and is still in production. My Magic 8 Ball has followed me to University and has been in all of my professional offices. It’s a little embarrassing how I still give it a shake when I’ve made an important decision to confirm whether or not it approves. And when I asked it if it was the right object to choose it said “As I see it, yes.” It was quite easy to register and upload an object so I recommend that readers go ahead and give it a try. At the very least it will force you to look at your personal objects in a new light. And you can log on to see my Magic 8 ball now that it's been approved by the site. Why not start a History of the World project in your community? What objects have found their way to your community from far-flung locations and what stories could your museum, and your community, tell about our world? Plus, this is a wonderful way to connect to members of your community and learn more about objects already in your geographic area. Find out what interesting objects exist in your community and provide access to those through a website. Perhaps your local PBS station would be interested in supporting the project and create programming featuring some of the objects that are important to you. In the meantime, there is no reason not to participate in the project here in the United Kingdom. Give it a try and upload your important object to the website and be part of the history of the world! I've noticed a number of artists lately who work with everyday materials and reinvent them into decidedly unusual or unexpected forms. I've written about this before and I continue to wonder at what is driving this phenomenon now. It may be that this idea of reinvention is fueled by thrift in an age of tight economics. Or it may be a reaction to the abundance of *stuff* in our consumer culture. Or maybe its about wanting to reshape the world to one's own vision of it - taking the raw materials of our environment and recombining, reimagining, and recreating them into a personalized version of that world. This last point of view requires you to approach post-its, crayons, pencils, and t-shirts (just for instance) as raw materials. I'm not an artist myself so its hard for me to know but all of these projects fascinate and intrigue me. They make "being an artist" more accessible, and at the same time I appreciate how different artists are from me. I just don't look at pencils and think "what if I carved the graphite instead of drawing with it?" Its amazing to me. And of course the idea of reuse and recycling a product into something else when its useful life is over is not exactly new. In my grandparent's lives of course the old clothes were recycled into quilts, and the old quilts into rag rugs. But a new generation of DIYers, a host of programs for kids emphasizing invention (By Kids For Kids and Design Squad are two of my favorites), and an increasing number of gallery shows featuring reinterpreted objects seems to be coalescing into something of a movement. These folks are not strictly reusing old things, or things that have outlived their usefulness. That is why for me this trend is a cross between art and creative problem solving. It seems a matter of curiosity, rather than necessity, but it also opens up a very large and inspiring "WHAT IF?" that carries over into other realms, other problems, other disciplines. I for one am very excited about this. And I think that museums are in an incredible position to take advantage of popular interest as well as an increasing understanding of the educational value of these experiments. So in that spirit - here are a few links to some cool projects. We'd love to see any others that you have been collecting! And if your museum has been experimenting with exhibits that engage visitors in reinventing with everyday materials we'd be curious to know how its going. Do visitors get it? Scott Moulton, Designer, Gyroscope, Inc.
One of our key sustainable strategies is to design for change. Change can happen on different scales - over years as museums refresh exhibits or change their themes, but also seasonally, and even within the course of a day. Different degrees of change need different strategies. And the infrastructure of a gallery ultimately has to be supported by furniture, finishes on the walls and floors, and the staffing plan. To be at its most robust the "platform" model has to be comprehensive. In this post I'll look at how furniture design can address the need for museums to accommodate different rates of change. Why Furniture? 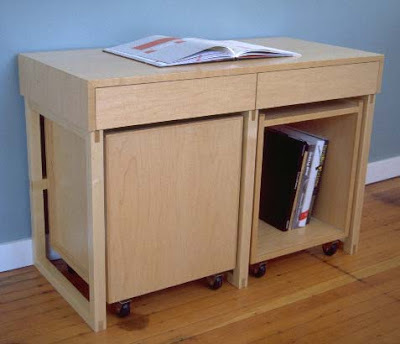 A table can be adjustable in height to respond to different age visitors. If designed as units, they can be ganged together for groups or used alone as individual learning stations. Sliding panels or screens can be moved to define spaces or open the gallery up. 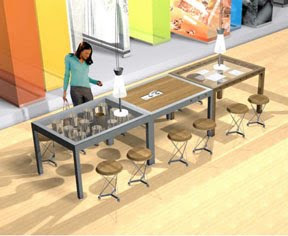 And lots of furniture can be designed as kits-of-parts that support reinvention as needs change. The images I've chosen to illustrate these ideas are starting points and inspiration. They are not all museum ready examples although some are pieces we built over 10 years ago and are still being used in museums today. We often describe furniture as a platform in which the table, shelving or wall is primarily there to support the program or activity. This rate of change is immediate - the design has to support whatever the visitor or staff are doing right at that moment. And in museums where staff are empowered to change programs often, or the museum wants to coordinate with local celebrations, or support new partnerships in the galleries, furniture that has been designed to support this change is a valuable asset. The design of platforms does not have to be neutral but it does need to be versatile enough to support a very wide range of uses and highlight the activities that it supports. Making this variability expressed in the design can give the furniture character and the visitor will see that their experience is able to change at a moment's notice. design Gyroscope Inc. for The Leonardo. These standard bases have unique tops designed for different specific activities. 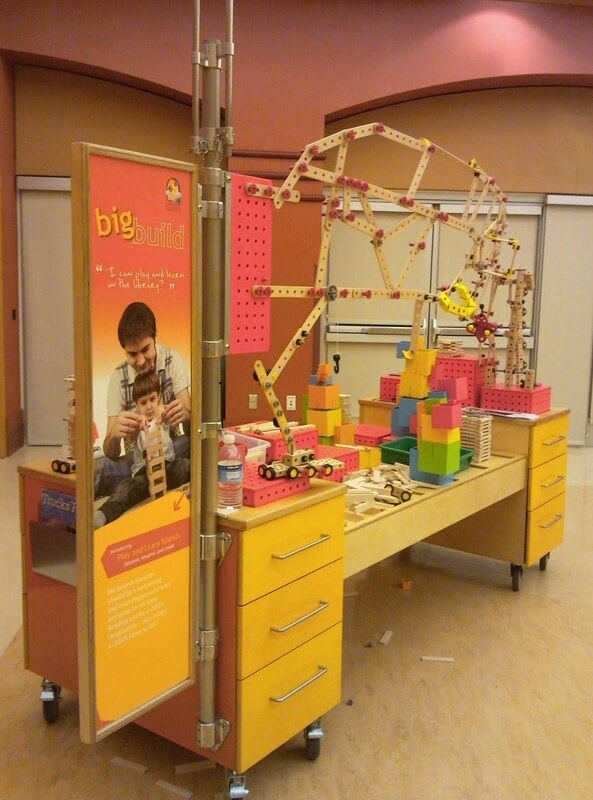 Staff can change tops to create a project surface, or use glass for display. They can make their own, new, tops as new needs arise. 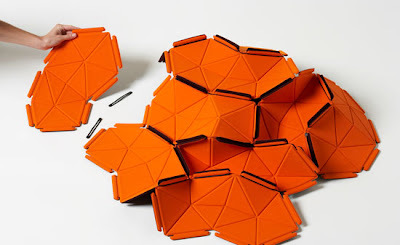 design Ronan and Irwin Bouroullec. Another kit-of-parts. This minimal table is the platform for a set of components that can be plugged in to support activities and define spaces on the table top. 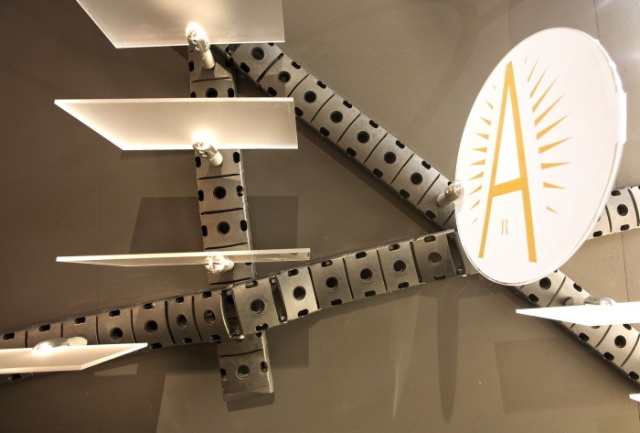 design ALU This wall system provides a playful way of attaching a wide variety of things to a wall including clip-on lights. Even when not filled up the track itself is appealing and creates interest. Another way to design for change is to create pieces that can be adapted by staff and/or visitors over the course of the day. Staffing levels, audience age and attendance shifts dramatically depending on the day of the week, or time of day, and we believe galleries should be flexible enough to respond. One key to supporting this type of variability lies in giving the staff a sense of ownership over the gallery so they can make changes in response to what they see happening. design Ronan and Irwin Bouroullec. 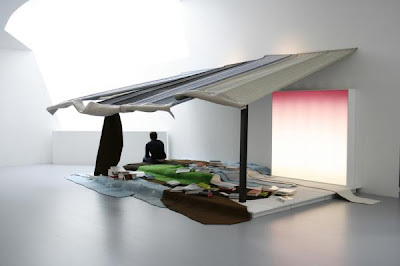 This design reference show how textiles are be a great material to create reconfigurable spaces. 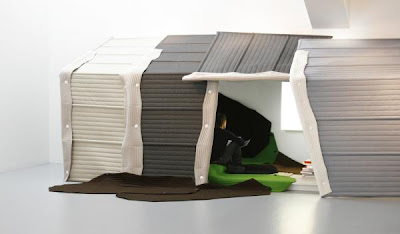 Think of the way forts made from sheets and sofa cushions can totally transform a living room. 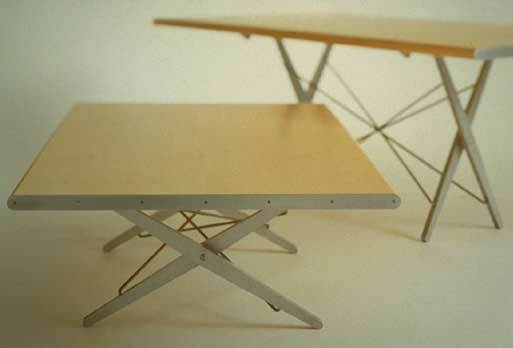 design Ronan and Irwin Bouroullec. 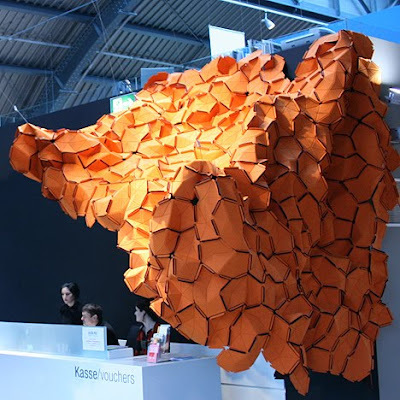 This textile made up of reconfigurable tiles suggests a scenario in which visitors take an active role in actually making the furniture that is reconfigurable. design Joshua Sailing. This bench supports very different social situations depending on how it is arranged. design John Randolph and Bruce Tomb. An adjustable table can serve several different audiences over the course of the day. design Union Studio. Carts can be stowed away when not in use. This nesting design offers many configurations. design Gyroscope Inc. for Exploration Place, Inc. 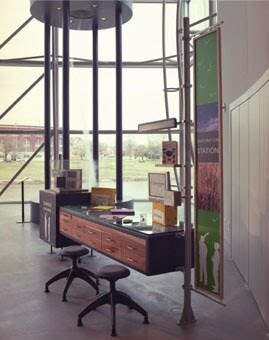 This example shows two staff stations that use magnetic graphics, display systems, collections drawers, and a flexible pole system. The design allows identical stations to be easily themed for different zones in the Museum. This adaptability gives the piece a much longer useful life since they can also be rethemed later as the museum's needs change. design: Gyroscope Inc. 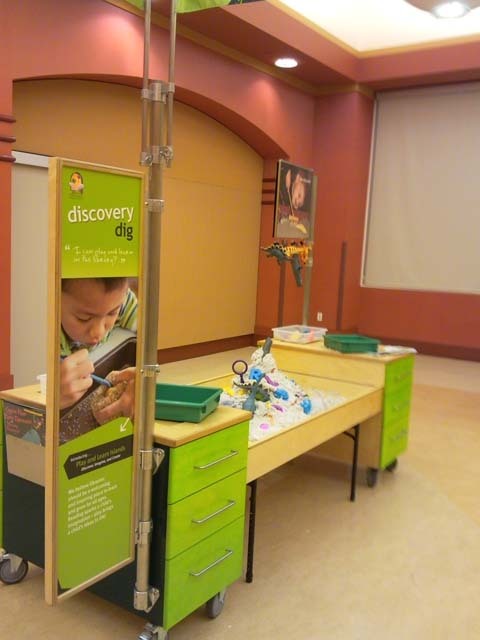 These cart-based exhibits for the Rancho Cucamonga Library were designed to bring museum experiences into a library. The basic structure is the same across 3 exhibits but the graphics and theming are flexible using magnetic vinyl and props that can be changed. This encourages staff to experiment and make adjustments to meet the needs of the audience. 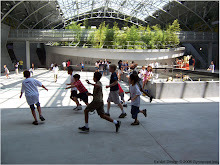 They are also reconfigurable and can be moved to a nearby courtyard or off-site program. design: Gyroscope Inc. We have developed this modular casework system for the Tempe Historical Museum to allow them to reconfigure their collection around different themes. 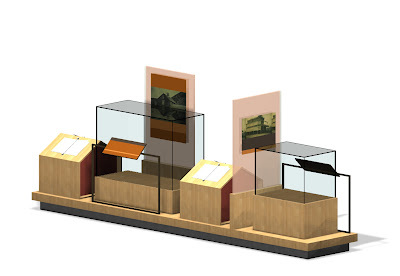 This modular display system accommodates artifacts, graphics and flip books and allows the museum to present their collection in different ways depending on the story they want to tell. design: Gyroscope Inc. 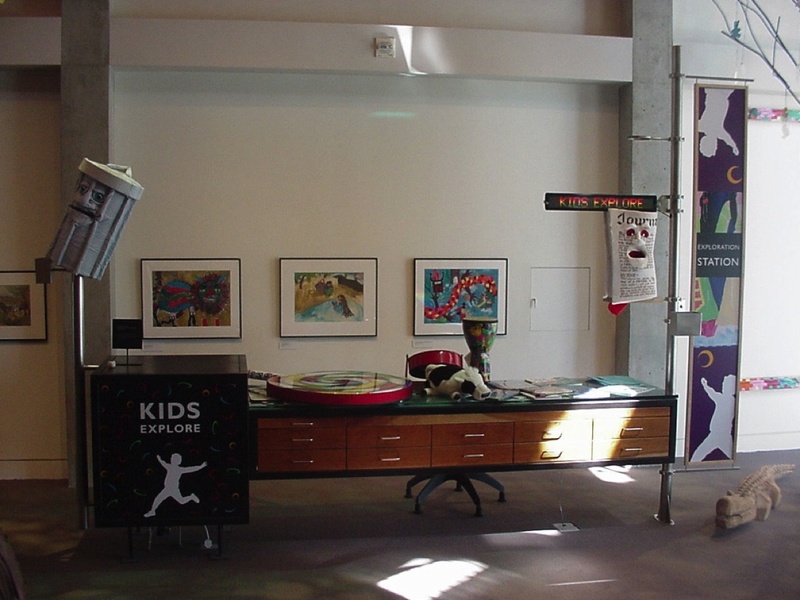 This graphic system allows for 3 rates of change: visitors can write on a chalkboard, community stories are compiled into flip books and more traditional museum graphics are mounted to the signs. 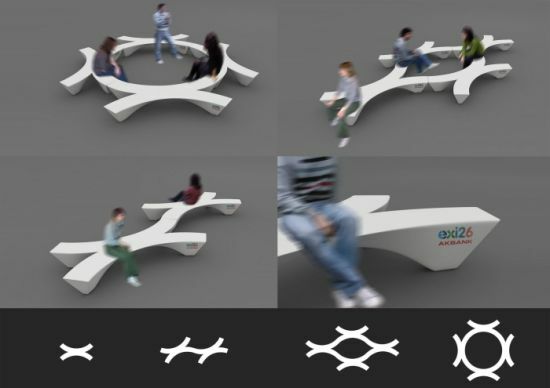 This "platform" strategy of designing furniture for change requires a holistic approach and may need to include several disciplines, including Architecture, graphic design, exhibit development, staff planning, and exhibit design, in order to be successful. In future blog posts I'll look at the architectural infrastructure required to support change as well as some implications for material choices.